Nowhere near as weak a board as we've seen from Intel in the past, but really struggles to achieve its Extreme enthusiast credentials. As part of the initial launch platform for Ivy Bridge we had high hopes for the Intel DZ77GA-70K motherboard, after all Intel's motherboard division has been really trying recently. That said, you may not even know Intel has been creating and selling its own line of motherboards for ages. You probably wont have seen many of them in the hallowed pages of TechRadar, and that's because generally they're a bit pup. Accompanying every Intel CPU launch of the last few years has been another weak Intel motherboard limping along to the party hoping some of the CPU hero-dust will fall on it. With the last release though things were different. The LGA 2011-sporting Intel DX79SI motherboard was actually a rather more impressive beast. And we have been reliably informed by Intel that the DZ77GA-70K is another such improvement. It's Intel's top chipset, so you'd think if anyone could do it justice then it should be the chip-manufacturers themselves. After all the Intel Core i7 3570K needs a good home, right? And with the full complement of PCIe 3.0 support along with multi-GPU lovin' from both AMD and Nvidia, and Intel's own native SATA and USB 3.0 support too it's got a lot going for it. 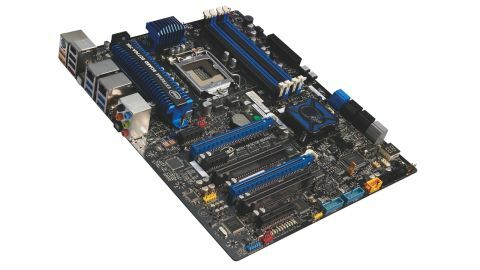 At stock speeds the Intel DZ77GA-70K is a decent board, keeping up with the likes of the ASRock Fatal1ty Z77 Professional. Sadly, it doesn't offer as solid performance when it comes to overclocking. We had settings from Intel to hit 4.8GHz, but even with the Corsair H100 it wouldn't even boot. For an enthusiast board to offer such limited overclocking is unfortunate.